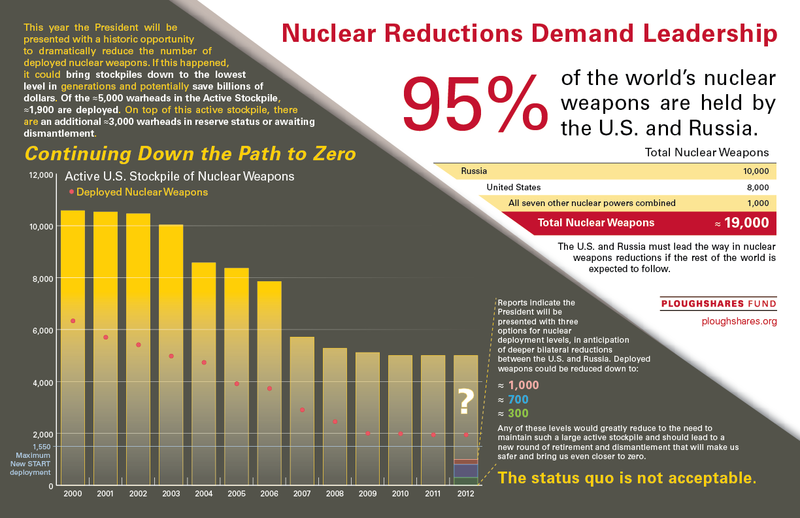 Cutting the Nuclear Stockpile in 2012? The ratification of New START by the U.S. and Russia set a new ceiling for deployed strategic nuclear weapons at 1,550 in each country. Given the cost of maintaining these weapons and their lack of utility on the modern battlefield, the U.S. could (and should) go even lower. (View the graphic at full size). There have been indications that President Obama will be presented with three options for the number of deployed strategic nuclear weapons: 1,000 – 1,100; 700 – 800; 300 – 400. There is of course, a fourth option: do nothing more than meet the minimum requirements set by New START. For many, that option is unacceptable. Just this week, former commander of the strategic forces, General James Cartwright led a group of notable national security experts (including Ploughshares Fund board member Senator Chuck Hagel, R-NB) in the release of a report calling for a nuclear force reduced to a total of 900 weapons, all of them taken off launch-ready alert. It is a significant sign that the military is increasingly behind the nonpartisan expert consensus that nuclear weapons have become a liability rather than an asset in today's national security calculus. 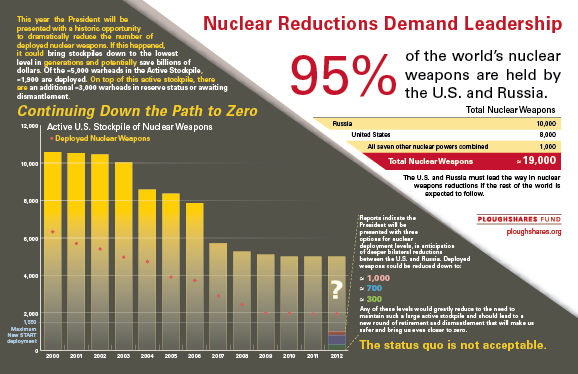 Lowering the number of deployed strategic nuclear weapons to even 1,000 will not only provide long term savings in this time of ever-tightening budgets but will also signal to the rest of the world that these weapons are no longer the paragon of national defense. Additionally, a new U.S. nuclear posture with deployments below New START levels will add credence to President Obama’s commitment to moving down the path toward zero. Since 2008 the number of weapons in the active stockpile has remained relatively flat. With lower numbers of deployed strategic nuclear weapons, the U.S. could again begin to address its outsized active stockpile of nuclear weapons, which stands at roughly 5,000 weapons. The U.S. can accelerate the dismantlement of outdated and retired warheads while reducing the number of weapons in the active stockpile to better fit its new deployment levels and twenty-first century security and budgetary needs.